Have you ever had to struggle to get a dog into position or keep him there for an exam or procedure? We often use force to restrain uncooperative dogs when techniques that incorporate finesse would work better. With Low Stress Handling® techniques you learn how to control movement in all directions while providing the support and guidance the dog needs to feel secure. Understand how to control the movement of the dog’s front and rear ends in all 6 directions (front, back, right, left, up, and down). Determine which of these directions each hold controls and when to use a minimal vs. a maximal restraint hold. 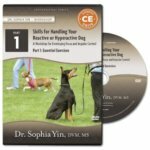 Learn how to safely get into position to restrain a dog and how to identify the common mistakes people make during this transition that increase their risk of being bitten. Discover how guiding dogs through position changes (including standing to lateral) in a secure and well-supported manner can change a dog from being resistant, and even aggressive, to being calm and cooperative. 69 mins / 1 units. Already have the DVD’s and want to earn CE’s?